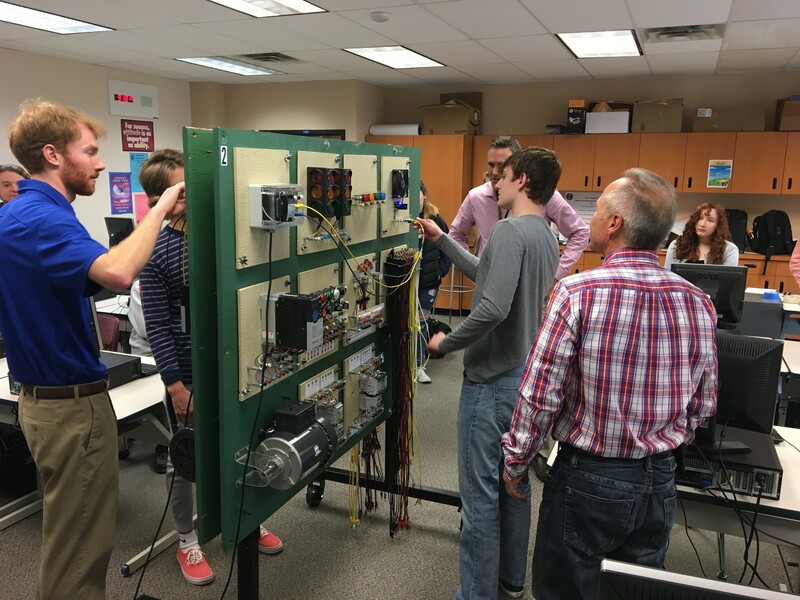 April 9, 2019 – Denver, CO –Mark Stratford, a recent college graduate and current Rotation Program participant at Encore Electric, visits local high schools to educate and encourage current students to consider career options in the trades, specifically in electrical construction. Stratford worked with the Associated General Contractors of America (AGC) on engaging with several Denver area high schools in February and March. Stratford worked with AGC and their workforce development industry partners to connect with students at Arapahoe High School. One of his first engagements was an off-site visit at a high-tech construction project with General Contractor Hensel Phelps. Students experienced a day in the life of a field engineer, doing layouts, surveying a site, and attending a VDC (Virtual Design & Construction) virtual and augmented reality tour, as well as a site tour where they were able to see thermal and anechoic chambers. Stratford also visited Arapahoe High School directly. He focused on giving students a look into the life of an electrician and the various daily challenges they might face. Stratford also went into the many pathways to a career in construction. His message emphasized the idea that college isn’t the only viable option for pursuing a lifelong career. Construction is a thriving industry where you can make both a living and build a fulfilling career. With a catalog of more than 100 different courses, Encore University offers employees a unique opportunity to become the best-trained craftspeople and professionals in the country. This education is free to employees and ensures that Encore Electric employs the safest and most skilled electricians in the industry. This hands-on and engaging look at a career in the trades gives students helpful insight into the many options they have after high school. This engagement culminated with Stratford being asked to cover a career panel presentation at Alameda High School in Denver. He was one of three professionals on the panel. He discussed his career trajectory, his mechanical engineering degree, and most importantly how he got his foot in the door as an intern with Encore Electric’s Technology Solutions business unit. He drove home the importance of internships and job shadowing opportunities that give real experience in a field, along with the value of less traditional paths that also offer rewarding life-long careers.